3TB maximum capacity expands the storage of your computer. Includes a USB 3.0 interface and a Serial ATA drive interface for fast and easy connectivity. Includes a USB 3.0 interface and a Serial ATA drive interface for fast and easy connectivity. USB 3.0 is compatible with USB 2.0. Quick response time provides data transfer rates up to 5Gbps via USB 3.0 and up to 480Mbps via USB 2.0. 7200 rpm speed for fast performance. Universal plug-and-play connectivity for compatibility with both PC and Mac. Optional 256-bit AES hardware encryption prevents unauthorized access so all you have to do is assign a password at setup. Schedule regular backups on your PC with Buffalo Backup Utility or on your Mac with Time Machine. Feature-rich software suite enhances functionality. Buffalo Tools suite includes Eco Manager, RAMDISK, Buffalo Backup Utility, SecureLock and TurboPC. Horizontal or vertical form factor enables versatile placement options on your desktop. Sleek, attractive chassis adds a stylish touch to your workspace. DriveStation Axis Velocity is an easy to use, high speed 1-drive USB 3.0 solution designed for simple and secure storage and backup. Equipped with a high speed 7200 RPM hard drive and USB 3.0 support, DriveStation Axis Velocity boasts extremely fast file transfers and is backward compatible with USB 2.0 for use with nearly any PC or Mac®. The DriveStation Axis Velocity provides reliable storage for your Mac or PC. With a high speed hard drive, it boasts extremely fast file transfer speeds. Optional 256-bit AES hardware encryption offers excellent data protection and its unique design allows for easy placement just about anywhere. Instantly expand storage or schedule automatic backups with universal plug and play connectivity. Equipped with a high speed 7200 RPM hard drive and USB 3.0 support, DriveStation Axis Velocity boasts extremely fast file transfers and is backward compatible with USB 2.0 for use with nearly any PC or Mac. Optional 256-bit AES Full Disk Encryption (FDE) protects your data from unauthorized access. Simply assign a password to the hard drive at setup and your data is shielded from wandering eyes. DriveStation Axis Velocity features a sleek, attractive chassis that can be positioned vertically or horizontally, adapting to the location it is used in for efficient use of space. Stand it upright on your home office desktop or lay it flat below your TV as part of your media center. It's fan-less design offers quiet operation for easy placement just about anywhere. 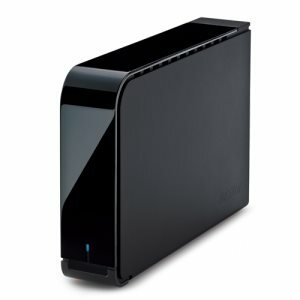 With terabytes of storage, DriveStation Axis Velocity provides a reliable, easy to use storage solution to quickly expand the capacity of your PC and Mac computers with universal USB 3.0 plug-and-play. DriveStation Axis Velocity is perfect for backing up your important files. Disaster and hard drive failures can occur unexpectedly; don't leave your important files and treasured memories in the hands of chance. Schedule regular backups for your PC with Buffalo Backup Utility or use Time Machine for your Mac. Protect all of your data, down to the last byte. Buffalo Tools is a feature-rich suite of optional software included on the Buffalo DriveStation Axis Velocity. Any or all of the following components of Buffalo Tools may be installed on Windows® PCs.